This entry was posted in Baby Deals on January 23, 2015 by admin. Sears has Delta Children Disney Pixar Cars II Toddler Bed for $29.99 with free in store pickup. This entry was posted in Baby Deals on December 30, 2014 by admin. 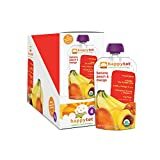 Amazon has Happy Tot Organic Baby Food, Stage 4, Spinach, Mango and Pear, 4.22-oz. Pouches (Pack of 16) for $12.83. Free shipping for Amazon Prime members or orders over $35. This entry was posted in Baby Deals on December 29, 2014 by admin.